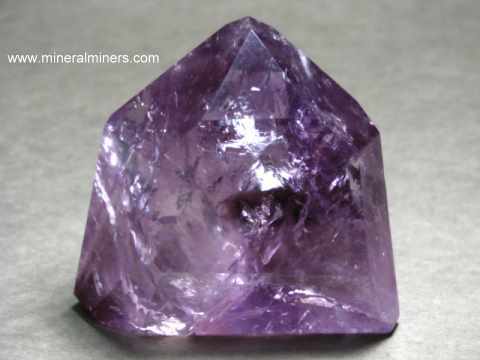 These pages will take longer to load since they contain all of our on-line selections of polished crystals for all minerals. NOTE: If the images on this page do not load properly (or if they take too long to load! ), then you should visit our Polished Crystals Alphabetical Index where there are links to separate pages for each mineral variety. The images of our polished crystals on these specific mineral variety pages will load much faster. Our polished crystals are sold and replaced on a daily basis, so do come back often! This is the end of page 1 of our Crystals (polished) of All Minerals virtual gallery pages. See also our page #2. Follow the linked image at left to enter directly into our Virtual Gallery of polished crystals for all minerals, complete with images, descriptions and secure SSL on-line ordering. This page will take much longer to finish loading as it contains all of our on-line selection of polished crystals for all minerals. These are sold and replaced on a daily basis, so do come back often! Would you like us to inform you when we add more polished crystals on this page? We have an enormous inventory at our mineral warehouses, so be sure to let us know if you have a special request. Please contact our webmaster or our 'site' geologist with any questions or comments.